Oh my gosh, this book should have been called "The Well of Absolute Tension". Tense is the perfect word to describe this book. Luthadel is surrounded on all sides by enemies, they have a weak but idealistic king, no food, a small army and winter is coming. There are spies everywhere it seems, and murders keep occurring with no explanation... *gnaws fingers* Tense, I say! I loved the political and espionagical (I know that's not a real word... I just made it up.) feel of this book. I loved learning as the characters learned and experiencing their fear and anger and frustration, as well as their hope and hopelessness. In fact, toward the end of the story, I read it in fits and starts because it was so tense that I kept setting it down... Anxiety!! I love love love when I can invest so much of myself in books, and when the book deserves that I do. And this series deserves it. WHY did I wait so long to read these? 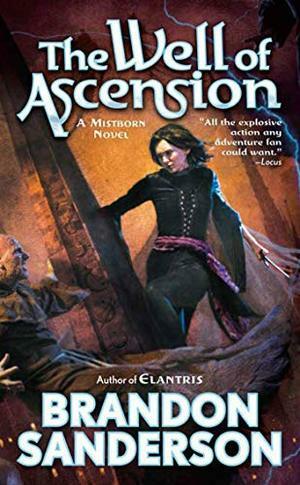 It was a different book from Mistborn, slower, less POW! (At least on the surface), but I've been in a kind of political, economical, judicial, legislative, informational place in my head lately, and this book was all of those things, as well as awesome and exciting and tense. Did I mention this was tense? Because it is. **CAUTION** This is a MAJOR spoiler. Click at your own risk. I don't understand how TenSoon replaced OreSeur as Vin's kandra... Did OreSeur die? I think he must have, but then I wonder how TenSoon could have killed him when I thought it was against his Contract to do harm -- or is that only to humans? Or, did Zane know the kandra's secret and use it to somehow kill OreSeur? I don't really understand that part. I get that the bones were a decoy, but I guess I don't get kandra/kandra interactions when one is under Contract to do harm to another... how does that work? Anyway. I loved this book, and I'm loving the series so far. I highly recommend these. Love, love, tense love!